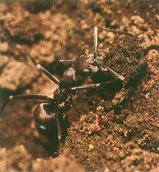 Camponotus japonicus ants open the nest in early April to start their activity. In early summer, a male and a female are mated. After November, they enter their winter hibernation. When spring comes, the surface of the soil becomes warm. 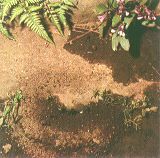 When this warmth spreads to the area where the ants are located, they open the entrance of the nest abruptly and begin to go outside. In Tokyo, this is observed around early April.